You can edit the survey appearance to create a title and subtitle, or change the question numbers on your survey. On the Summary page, click Survey Appearance (found in the Settings area in the center right). Or, from the Build page, click Edit appearance. You will move to the Edit Appearance page. 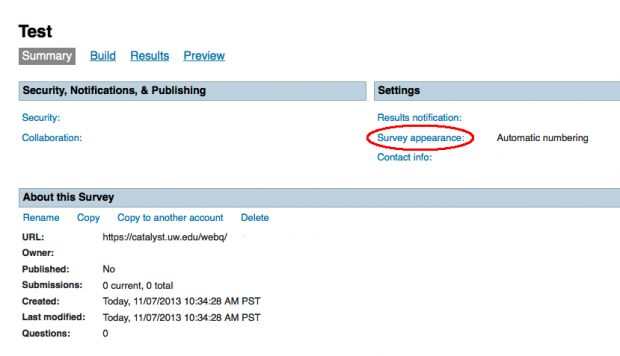 Select Display this title at top of published survey and then enter a title in the space provided. To include a subtitle, select Display this subtitle at top of published survey and then enter a subtitle in the space provided. Click Save to save your changes and return to the Summary page.